Alex R. Ruiz is a Certified SolidWorks Professional and engineering manager for a leading medical device manufacturer. He designs new products and trains and supports over 100 SolidWorks users. Alex has close ties to the SolidWorks development team and is very well known in the SolidWorks community as "the SolidWorks geek," which is the name of his blog (www.TheSWGeek.com). Gabi Jack is a Certified SolidWorks Professional and mechanical engineer who maintains a popular blog about solid modeling, design, and engineering (www.GabiJack.com). 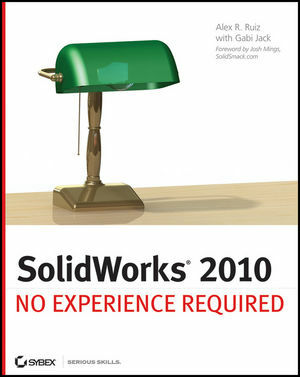 Chapter 1 Becoming Familiar with SolidWorks. Chapter 2 Learning the Basics. Chapter 3 Creating Your First Part. Chapter 4 Creating Your First Drawing. Chapter 5 Creating a Revolved Part. Chapter 6 Creating a Subassembly. Chapter 7 Creating a Simple Assembly Drawing. Chapter 8 Creating a More Complex Part Model. Chapter 9 Modeling Parts Within an Assembly. Chapter 11 Putting It All Together: Part 1. Chapter 12 Putting It All Together: Part 2. Chapter 13 Making the Top-Level Assembly Drawing. Chapter 14 Sharing Your Documents with Others. Chapter 15 Creating Your Own Templates: Part 1. Chapter 16 Creating Your Own Templates: Part 2. Chapter 17 Creating Simple, Stunning Renderings.